Below are some poems from a book called “A Line o’ Gowf or Two” written by Bert Leston Tayor and published by Alfred A. Knopf in 1923. 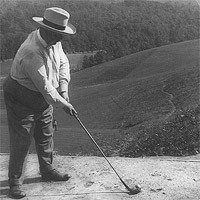 Charles “Chick” Evans, the famous Chicago amateur golfer and a friend of Taylor’s, wrote the introduction. Taylor was a newspaper columnist, poet and writer. From 1910, until his death in 1921, he wrote a daily column in the Chicago Tribune under the byline “A Line o’ Type or Two.” During this time he became one of the most widely read newspaper humorists. His book is a posthumous compilation of his golf writings and poetry taken from his Tribune column. On how the tide will turn. Why did I hook that drive? And all the talk is loud. And all the talk is foolish. Hey, Caddy! Watch that ball! By doing so he lost his job and left colleagues disconcerted.